During our service time of 14 months we had to visit several specialized training camps and schools, which is normal when learning for Army Engineer because it is a rather technical trade (Army Boat School, Bridge school, Mine School, etc.) But we also had to perform in an important number of national and international exercises, with Reforger 83 (Return Forces to Germany) exercise ‘Atlantic Lion’ as the most important one. We were told that this ‘Reforger’ would be an ‘extra large’ one, at a scale which was practiced only once every five years. We had no idea when we started this exercise: as ordinary soldiers we were only informed ‘minutes’ before we were about to start up some task. Our first task was a part of the ‘Atlantic Lion’ exercise called ‘Aqua Marine’. We had to build a bridge over the Maas river in the south of Holland. Hard labor because the equipment we used were old German made pontoon-bridges which came as kits on old trucks. The parts were dumped in the water and then maneuvered in a way they could be coupled together. After that, all equipment like the ramps, winches, road-side-boards etc. had to be carried onto it by hand. All very heavy stuff and very unhealthy for ones back. As soon as the bridge was ready the US and British troops heading for Germany arrived, some 2000 vehicles would cross our bridge, most American, some british. And since I was praised for my knowledge of languages I was appointed to give instructions to each and every vehicle crossing our bridge. At the end of the week, when all troops had crossed we were brought to an army base in Mill, Holland where we would stay for the weekend. Soon we found out that the base (which at first sight had seemed deserted) had to be shared with a large unit of US troops who told us they were US Army Engineers which had just been flown in from Texas. 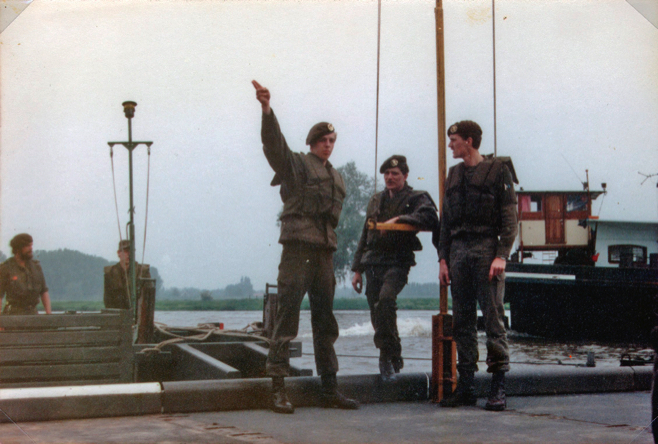 Personally I was quite surprised to see how ‘relaxed’ their discipline was (compared to ours) Some of the US soldiers were fascinated by our Belgian FAL rifles which they called ‘elephant rifles’ and indeed: when comparing them, their M16’s felt like toys. But most of all I was surprised to find that many of these troops were mainly interested in buying narcotics from us. After this ‘socializing-weekend’ (I managed to swap some of my own gear for a M65 woodland Jacket) we were taken into Germany where at some stage we briefly met with British Commando’s and then we were ‘parked’ in a wood where we stayed for over a week doing nothing but eating American rations. I think we had been working and ‘camping’ some 3 weeks when we finally returned to base. What we did not know at the time, and what I found out only last week when I watched a documentary on German TV (see: http://www.zdf.de/ZDFmediathek/beitrag/video/1269836/1983---Welt-am-Abgrund#/beitrag/video/1269836/1983---Welt-am-Abgrund ) (UPDATE MARCH 2016: I see this link does not function any longer but I found the same documentary on youtube: https://www.youtube.com/watch?v=nI-MpJMg738 or https://www.youtube.com/watch?v=yxRY7J0Jqxg ) So what we did not know back then is that NATO had made this exercise a little bigger then usual, they had extended the main Reforger exercise with an extra exercise called ‘Able Archer’. In 2013, 30 years after the actual event NATO documents were declassified and it was found out that ‘the hottest days in the cold war’ took place during 1983 and were caused by several events, but the most important events were the ‘Atlantic Lion’ and ‘Able Archer’ Reforger exercises. The Russians were convinced that when NATO would attack them this would happen during a Reforger, this because for these occasions the US brought thousands of extra troops to Europe to join the exercise. This year, in 1983 several events had taken place before the Reforger had started: the Soviets had downed a Korean Boeing believing it was a spy plane (which it was not) which was exploited by the US where Ronald Reagan called Russia an ‘Evil Empire’. A new warning system which Russia had launched (a satellite) had malfunctioned which almost had resulted in a Soviet counter attack on a US nuclear attack which had never taken place (rays of sunlight were falsely identified by the satellite as Missile launches) And, last but not least: the US had started placing Pershing 2 missiles in Europe, a new tactical nuke which could reach Moscow within 7 or 8 minutes when fired from Holland or Germany. The Russians were nervous and alert. When Able Archer started the Russians did not know that it was actually an exercise, even though all messages transmitted during this exercise were clearly marked ‘exercise’ (which the Russians believed was only done to distract them) Able Archer was in fact to exercise a situation where NATO had come under attack from Russia and was to test all procedures for a counter attack. The Russians were so convinced that NATO was about to attack them that their missiles and bombers were ready to take off (manned, engines running and armed with nukes) And only because of some counter spies who were able to convince their superiors in Russia that there was no actual attack taking place, these planes and rockets were not launched. But according to the documentary this had been only a matter of minutes or they would have attacked. According to the documentary the happy ending of this story is that Ronald Reagan, who appeared to have been in shock when he found out about this close call, decided to change course. Peace negotiations with the Russians were started up and 5 years later, in 1988 Reagan met with Russian president Gorbachev in Moscow. In 1994 I built ‘my own bridge’ to Russia. Together with my wife Hania we drove to Leningrad (St Petersburg) in an old Volvo estate. I made good contacts there with Russians who gratefully had used the new opportunities to start their own businesses, and for several years I sold mainly Russian surplus diving equipment on the European and American market and assisted the Russian contact with purchasing diving equipment from here to sell on the Russian market. May 18 2015. It is very sad to see today that apparently there are still people who prefer to live in a state of war rather then to build on peace. Are the Russians having bad luck with their leader: a former FSB colonel who seems to have a personal gain in pushing his country towards a war with so called nazi’s from the west? Or is he the inspiring leader who does what he can to prevent Russia to be sucked into a world where tech-camps, banks and multinational corporations dictate their own convenient truth? A photo I took during an exercise a while before ‘Atlantic Lion’ in 1983. 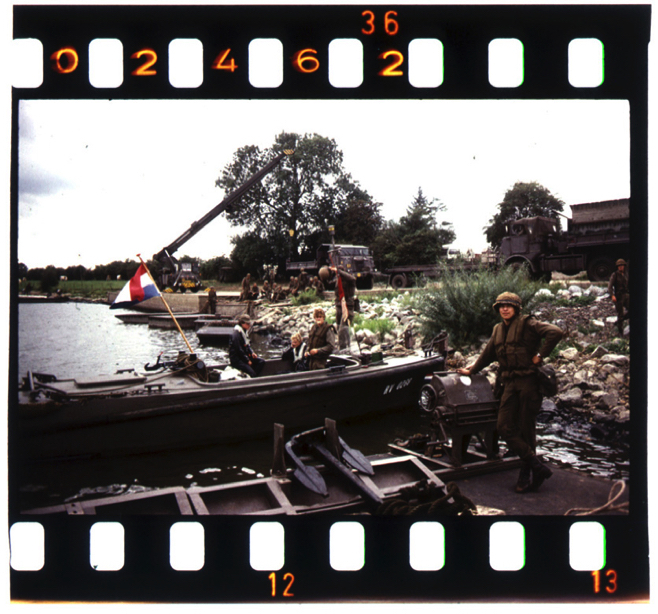 Old army trucks deliver even older German floating bridge components at a riverside somewhere in Holland. We built a floating bridge out of it. 1983. ‘Pontonplaatvlot’ Practicing on the Maas river for my boat license.